As Tran Cong Tien tells it, he was mad as hell and he wasn't going to take it anymore. Pulled over by a Hanoi traffic cop a few weeks ago for driving in the wrong direction down a one-way street, he says he tried to be reasonable. Tien claims the $6 bribe offered was more than fair, but the officer wanted more to ignore the traffic violation. Words between the two escalated. Insults flew. And then Tien snapped. "I grabbed his neck and pushed hard," he says. "I have never dared challenge the police. I'm fed up with corruption and at that moment I was just so frustrated!" Corruption in Vietnam is nothing new. 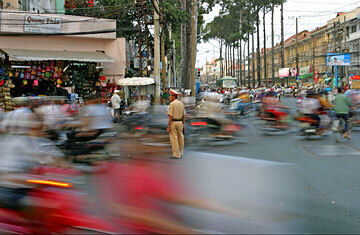 Last year, Transparency International ranked Vietnam 121st out of 180 on its Corruption Perception Index. But it was perhaps easier to overlook occasional shakedowns from officials when Vietnam's economy was doing well and incomes were doubling every few years. That's no longer the case. People being squeezed by the economic downturn are increasingly frustrated by the nation's enduring corruption, says Trinh Hoa Binh, head of environment and health at the government-run Institute of Sociology in Hanoi. Officials are maintaining their special privileges while the economic position of ordinary Vietnamese is becoming more precarious. They are incensed, he says, that corrupt officials are rarely punished for taking bribes. The anti-police backlash playing out around the country is unusual considering that Vietnam is a relatively efficient authoritarian state where dissent is rarely tolerated. In two recent incidents, motorcycle riders pulled over by police set their own bikes alight rather than let them be impounded. Last month, a car dragged a Hanoi policeman 15 feet before racing off. An angry crowd seeing a cop roughing up a driver in the southern province of Dong Nai used bricks to smash the officer�s motorcycle. The incidents have garnered only limited attention in state-run media, which dismiss most as the work of criminal minds or hooligans. But witnesses, who have posted videos and camera-phone shots online of burning motorcycles and farmers battling police, say the spurt of violence is a sign that the public has finally had it with corruption. The government won't confirm whether attacks on police are on the rise, but it is concerned enough that the Ministry of Public Security held a conference late last year to address the issue. Colonel Huynh The Ky, the director of security in southern Ninh Thuan province who attended the conference, attributed the increase to "teenagers who lack proper education and are corrupted." Ky said he would like to see police provided with more sophisticated equipment in order to protect themselves, but he added that the "attitude of some police officials sometimes is not appropriate. Police have to work in the spirit of serving the people. They must have proper behavior." Vietnam's working classes have risen up against authorities before  with results. The most famous farmers' revolt took place in the northern province of Thai Binh in 1997. Burdened by excessive taxation and illegal fees, thousands of villagers challenged local officials over the course of several months. When their demands to be heard were ignored, they stoned Communist Party cadres, attacked their offices and homes, and held officials hostage for days. The national government eventually took charge, disciplining local officials and sending some to jail, along with some of the farmers. The following year, a national law known as Decree 29 was passed, allowing for more participation in local decision-making and giving citizens more opportunities to vent their grievances to commune-level officials. The past decade of stunning economic growth in Vietnam helped to ease these frustrations. But 10 years on, with only marginal improvements in transparency and with corruption still rampant, patience is wearing dangerously thin again  a fact that Vietnam's leadership recognizes. "There is corruption and abuse of power in local areas," concedes Nguyen Minh Thuyet, a senior member of Vietnam's National Assembly. Though he does not condone the recent attacks on government property, Thuyet says he understands the anger and agrees that the government must do more to improve transparency. As jobs continue to vanish and inflation eats away at wages, it is not going to be as easy to placate those who are being hit the hardest when police attempt to extort them for petty cash. "The police are even more corrupt than they were before," Hanoi taxi driver Nguyen Van Cuong says bitterly. "In one day, I can be stopped several times." And where 100,000 dong, or about $6, might have been enough a few years ago, now nothing less than 200,000 will do. "It means some days I work for nothing, as they take everything I make," Cuong says. "How can you not get angry?"